Less than two weeks before the U.S. Supreme Court will hear oral arguments in a lawsuit challenging the constitutionality of the 2010 health care law, the public is evenly divided about the legislation. 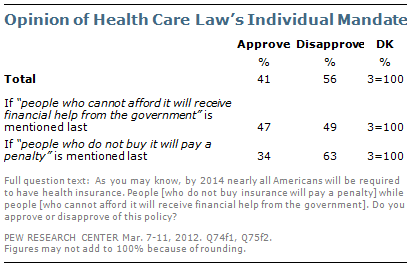 Overall, 47% approve of the law, while 45% disapprove. The 47% approval represents an uptick in support since January 2011 (41% approve vs. 48% disapprove). Since the bill became law on March 23, 2010, disapproval of the legislation has been fairly steady, ranging from 44% in April 2010 to 48% in January 2011. Approval has shown somewhat more movement, from a low of 35% in July 2010, to a high of 47% in the current survey. Republicans are unified in opposition to the law, with 84% disapproving and only 11% approving. By a wide margin (76% to 17%), Democrats approve of the measure. Independents are divided (44% approve, 47% disapprove). 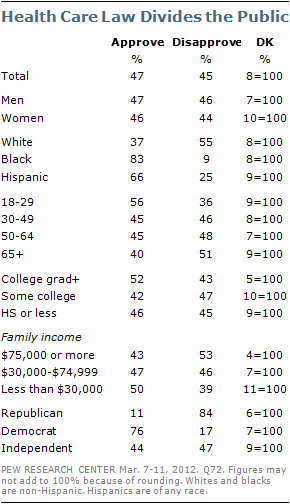 Younger adults are somewhat more likely to approve of the law than are older adults, while upper income adults are more likely to disapprove than are the least affluent. A large majority of blacks (83%) approve of the law, as do 66% of Hispanics; far fewer whites approve (37%). Given the division in overall opinion of the health care law, it is not surprising that there is no consensus about what Congress should do about it. Overall, 38% favor repealing the law, while 33% favor expanding it and 20% favor leaving it as is. Opinion about what to do with the law is essentially unchanged since the fall of 2010. Most of those who disapprove of the law favor repealing it (76%). Among those who approve of the law, 54% would like to see it expanded, while 34% favor leaving it as is. Support for repeal reaches 50% or higher only among Republicans (74%), including conservative Republicans (82%), and higher income adults (52% among those with family incomes of $100,000 or more). A 56% majority of the public disapproves of the health care law’s requirement that all individuals be covered by health insurance or face a penalty; 41% approve of the mandate. The provision, which will take effect in 2014, includes financial subsidies for people who cannot afford the cost of coverage. 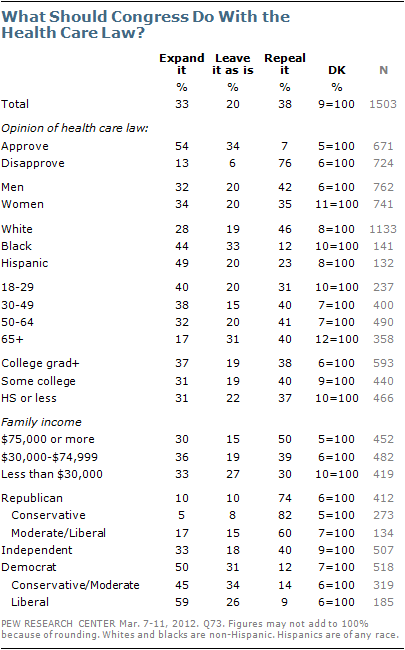 Not surprisingly, opposition to the mandate follows the same contours as overall opinion about the health care law, with Republicans much more opposed than Democrats and independents, and blacks and young people more supportive than other groups. In addition, college graduates are divided over the individual mandate (49% approve, 49% disapprove) but are more supportive of it than are people with less education. A close examination of patterns of response to the question suggests that opinions on this issue, which is at the heart of the case before the Supreme Court, may not be especially firm. The survey question mentioned both the financial penalty to be assessed for failure to purchase insurance and the financial assistance the government will provide to those who cannot afford a policy. But levels of approval of the provision were highly sensitive to which aspect of the law was mentioned last. Among those for whom the question ended with the reference to financial help, opinion is evenly divided (47% approve of the mandate vs. 49% who disapprove). But among those who heard about the penalty last, most disapprove of the provision (63% disapprove vs. 34% approve).